Drama. Not every casino is a sure thing, but the CEO and “Casino Mogul”, Mr. Sheldon Adelson, is said to be one of the richest men in America, and we can be sure that he did not get there by gambling. 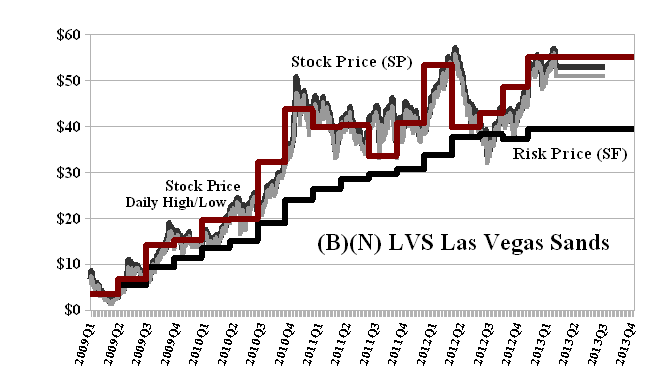 We don’t know anything about casinos or gambling, but we started buying the stock of the Las Vegas Sands Corporation at $4 in 2009 and can get $53 for it today, although that’s still cheap compared to the $130 that it fetched in 2007 before bottoming out a year later (The Associated Press, April 5, 2013, Casino mogul Adelson (a witness for the defence) more argumentative on 2nd day on stand in Vegas breach of contract case). And we kept it for only one reason – the ambient stock prices, regardless of volatility, ups and downs, tended to remain above the price of risk which we calculate as the Risk Price (SF) (please see Exhibit 1 below, Red Line Stock Price (SP) above the Black Line Risk Price (SF)). That seems impossible and would not be possible absent a heads up policy of price protection using our usual method of either stop/loss selling, or, of “collaring” the current stock price. For example, the current Risk Price (SF) is $40 and the estimated downside volatility is minus ($7) which could sell us out at $46 and still be well above the price of risk. Alternatively, the September put at $50 is available today for $3.80 per share, and we can sell or short an opportunistic September call at $55 for $3.70, or at $57.50 for $2.80, so that for $0.10 per share ($3.80 less $3.70), we can “collar” the price between $50 and $55 for the next five months; or, for $1 per share ($3.80 less $2.80) between $50 and $57.50 for the next five months, and collect our dividends of $0.35 per share per quarter, or $1.40 per share per year of the $1.1 billion that is expected to be paid to the shareholders this year for a current yield of 2.7%. Las Vegas Sands Corporation operates fully integrated resorts featuring casino, hotel, entertainment, food and beverage, retail, and convention center operations. The Las Vegas Sands Corporation develops, owns, and operates integrated resorts in Asia and the United States. The company owns and operates The Venetian Macao Resort Hotel, the Four Seasons Hotel Macao, the Plaza Casino, and the Sands Macao and Sands Cotai Central in Macau, the Peoples Republic of China. It also owns and operates the Marina Bay Sands in Singapore; The Venetian Resort Hotel Casino, the Palazzo Resort Hotel Casino, and the Sands Expo and Convention Center in Las Vegas, Nevada; and the Sands Casino Resort Bethlehem in Bethlehem, Pennsylvania. The company’s integrated resorts comprise accommodations, gaming and entertainment facilities, retail facilities, convention and exhibition facilities, celebrity chef restaurants, and other amenities. Las Vegas Sands Corp. was founded in 1988 and is based in Las Vegas, Nevada. The calculated Risk Price (SF) is a provably effective estimate of the “price of risk” which is “the least stock price at which the company is likeable” (Goetze 2009) and “likeability” is determined by the demonstrated factors of “risk aversion” – we want to keep our money and obtain a hopeful return above the rate of inflation. Stock prices that are less than the price of risk are “bargain prices” but with the risk attached that the company might never get a higher price other than that due to ambient volatility. On the other hand, investors who are willing to pay the “full price” above the price of risk, and buy and hold the stock at those prices, must also be confident, and have reason to believe, that the company will produce those values, absent new information. Please see our Posts, The Price of Risk, August 2012 and The Nash Equilibrium & Its Stock Price, October 2012, for more details.